Humidity is the quantity of water vapor present in air. It can be expressed as an absolute, specific or relative value. Relative humidity is usually expressed in per cent and abbreviated by φ or RH. 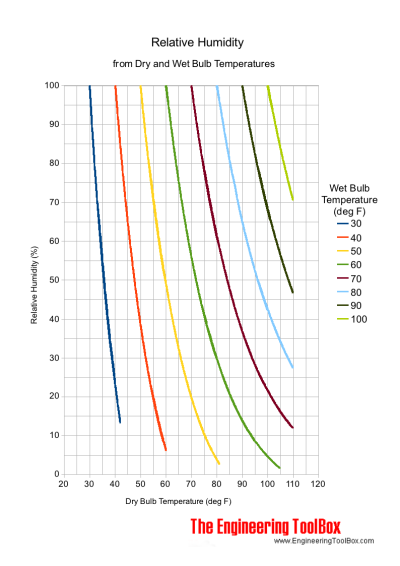 Relative humidity as the ratio of vapor partial pressure in the air - to the saturation vapor partial pressure if the air at the actual dry bulb temperature. pws = saturation vapor partial pressure at the actual dry bulb temperature [mbar]. This is the vapour pressure at maximum content of water gas in air, before it starts to condense out as liquid water. 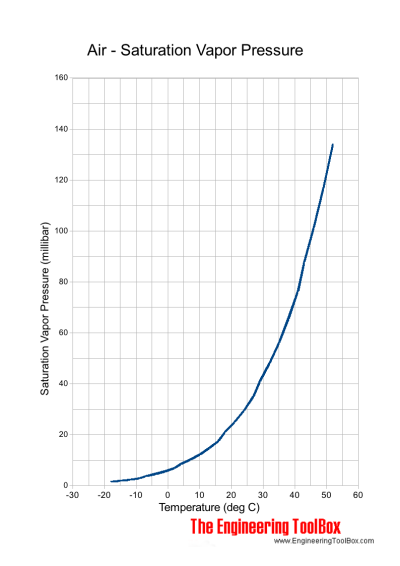 If the water vapor pressure in the air is 10.3 mbar, the vapor saturates on a surface with 45oF (7oC). Note! The atmospheric pressure of air is 1013 mbar (101.325 kPa, 760 mmHg). As we can see the maximum water vapor pressure - the saturation pressure - is relatively small. 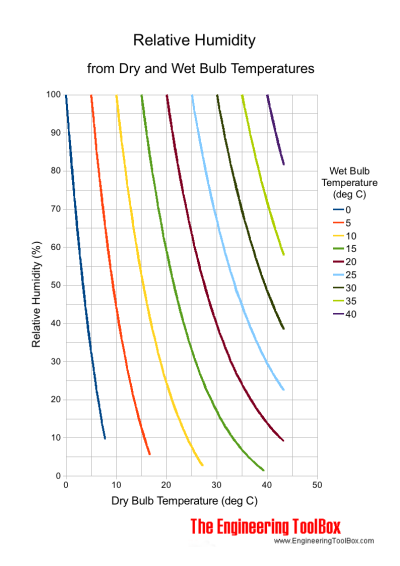 Relative humidity can also be expressed as the ratio of the vapor density of the air - to the saturation vapor density at the the actual dry bulb temperature. A common unit for vapor density is g/m3. Relative humidity can also be expressed as the ratio at actual mass of water vapor in a given air volume - to the mass of water vapor required to saturate at this volume. Engineering ToolBox, (2004). Relative Humidity in Air. [online] Available at: https://www.engineeringtoolbox.com/relative-humidity-air-d_687.html [Accessed Day Mo. Year].